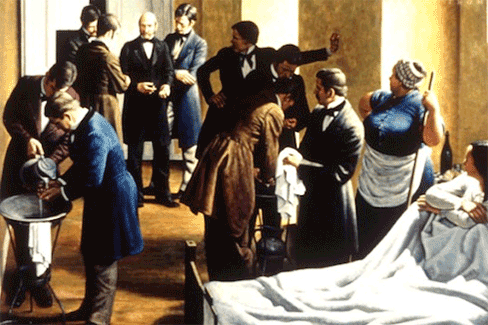 In 1846 the general hospital in Vienna was experiencing a peculiar problem. There were two maternity wards at the hospital but at the first clinic, infant mortality rate was around 16% while at the second clinic the rate was much lower, often below 4%. Mysteriously there were no apparent differences between the two clinics to account for this. Part of the mystery was that there was no mystery. Almost all of the deaths were due to puerperal (childbed) fever, a common cause of death in the 18th century. This fact was well known outside the hospital and many expectant mothers begged to be taken to the second clinic instead of the first. The stigma around the first clinic was so great that many mothers preferred to give birth in the street than be taken there. 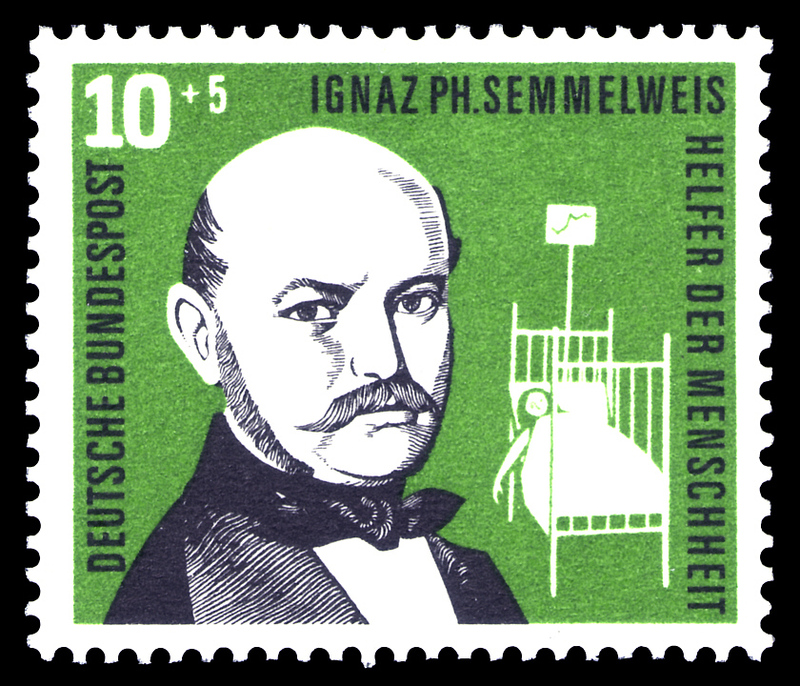 Working at the hospital at the time was Ignaz Semmelweis, a young doctor who had risen to the ranks of assistant professor where his duties included the examining patients before the professor’s rounds. Perturbed by the seemingly unsolvable nature of this mystery, young Ignaz recorded that it made him “so miserable that life seemed worthless” and so dedicated himself to finding a solution. The breakthrough came when his close friend and colleague Jakob Kolletschka died of the same infection after cutting himself with a surgeons scalpel during an operation. Semmelweis then noticed that in the first clinic doctors were routinely conducting autopsies whilst in the second this practice did not occur. He also noticed that doctors were often delivering babies and treating patients with the same unwashed hands they were performing autopsies with and so proposed that doctors were contaminating patients with “cadaverous particles.” He then insisted doctors wash their hands in a chlorinated lime solution before dealing with patients resulting in a drop in deaths from puerperal fever to around 1%. 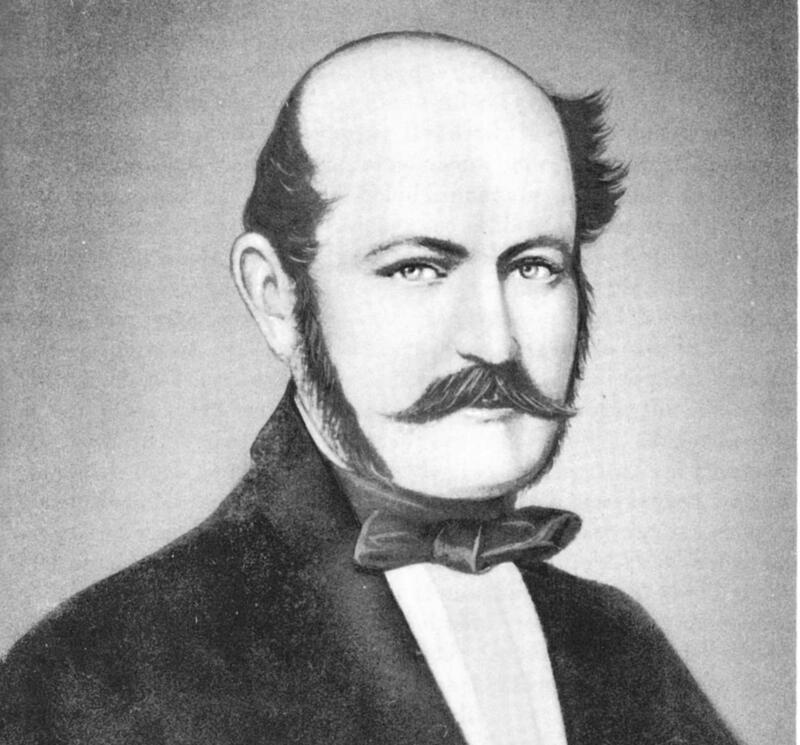 This reactionary short-sightedness gave rise to the the term The Semmelweis Reflex: “the reflex-like tendency to reject new evidence or new knowledge because it contradicts established norms, beliefs or paradigms.” Now education is clearly very different from medical practice, but there are things we are discovering about the process of learning that the profession can no longer afford to ignore. In the last 10 years we have witnessed an explosion in what we know about the essential dynamic of how the brain retrieves and stores information. The field of neuroscience in particular has afforded huge opportunities to the profession by challenging and clarifying erroneous beliefs through not just solid evidence, but important evidence yet still many many of these problematic ideas are still widespread. We now know for example that left and right brain thinking is not supported by any evidence, we know that the belief in learning styles is not just wrong but dangerous, we know that the claim that we only use 10% of our brain is completely unfounded and that if you are using Neuro linguistic programming for education purposes then you might as well be practising astrology. Yet despite these important findings, may of these beliefs still persist in education settings today. Against this clearing out period of debunking and myth-busting, we have also had a number of significant discoveries such as Sarah Jayne-Blakemore’s work on the teenage brain and the fact that “disorders like anxiety disorders, depression, addictions, eating disorders, almost all of them will have their onset some time during the teenage years.” Her work proposes to explore how “genes and the environment influence brain development, like for example, how adolescent brain development differs between cultures is something that no one has yet asked, and yet it’s bound to.” These issues and the potential findings from them seem to be not only integral to the practice of teaching children but also ethically imperative. Yet how much of these findings are properly embraced by the profession in a way that is commensurate with other professional fields? Whole School Cognitive Dissonance: What is the value in a school preaching Growth Mindsets in an assembly yet basing their entire school enterprise on the reductive and fixed mode of target grades and narrow assessment measures based on poor data? Why are kids explicitly told that their brain is malleable but implicitly told their target grades are not? If not evidence then what? If educators are not interested in evidence then what are we actually talking about? Are we basing our entire professional practice solely on our own experience in the classroom 10 or 20 years ago? Or should our professional judgement be one that is informed by and that engages with a wider body of knowledge from different disciplines? Are we so arrogant to think we have nothing to learn from different fields? Ethical considerations: If research shows us that certain practices lack any evidence or are ultimately a waste of time, is it ethically right that teachers continue to use these practices? As mentioned, learning styles has been fairly widely debunked now but why does it continue to linger in so many educational arenas? And what are the implications of new research for educational monoliths like group-work, differentiation, Bloom’s taxonomy and traditional marking? Three of the most important aspects of teacher development are trust, professional judgement and autonomy but surely that judgement and autonomy is only enhanced and not hindered by new findings about how learning takes place. As with Semmelweis’s detractors we shouldn’t be rejecting new ideas and discoveries, especially ones that are so relevant to our field but rather incorporating them into our own practice. One of the challenges to education research is the perceived threat of “evidence” as an axiomatic truth to be delivered on high that will limit teacher autonomy and agency in the classroom but I for one am excited by education incorporating these new findings around memory, retention and performance and incorporating them into their own professional practice and then making them applicable in the classroom where they can have the most impact. Thanks for the story about the Hospitals and for referencing Sarah-Jayne’s work. I’m 100% behind your final paragraph on how research can be empowering, if we allow it to empower us. The alternative? If we ignore it for too long then someone will get frustrated and force these evidence-based practices onto teachers via accountability measures. Being empowered is a choice and there has never been a better time in history for individuals to easily and cheaply track whatever research interests them and to mindfully and openly apply findings to their own work. One thing about research, just like anywhere we have job-titles, there are people with the job ‘researcher’ who are just churning out research because that’s their job. Sarah-Jayne is an obvious exception and it’s easy to tell because of how open she is about her own reasons for exploring this field and the limitations and truths of her research. But, of course, teachers who choose to follow research will soon figure out these differences in quality. An exciting learning curve’s ahead! Thanks for the tip Carl. I’ve just signed up to their newsletter to keep an eye on what they’re doing. A sort of a “common core” for teachers to enable them to teach a “common core” to students. Great article, thanks. Harvard GSE backs knowledge while simultaneously being the ivory tower backbone to value added teacher evaluation measures of the same poor data referenced in the article. Chetty et al responsible for hellacious and fallacious evaluation methodologies that have the unintended consequence that whole swaths of education experience cognitive dissonance that has much political clout behind it. Data is king while critically evaluating that data is suspect/against ‘educational reform’. Political interests are vested in making sure actual evaluation/analysis points in only one direction. Hope is that calls to reason like this article will make people stand up and rail for thorough and thoughtful course of action, what ever that looks like. Thanks for this article – I work in teacher education and am trying very hard (in the atmosphere you describe) to work with the research findings. I so agree about the 1 year (but don’t forget a significant number of primary trainees do get more that this in that they get three years in a BA / BEd programme – which has a little more space to cover things) and am now refusing to use the term NQT for the trainees as they finish their PGCE but instead am using the term “beginning teacher”. I am also developing a Master’s Programme called the, “MA in pedagogy and practice” which aims to build on the foundations laid in the PGCE and get the students to be critical researchers of their own practice and the practice in their schools. This is a 2-3 years part-time programme rooted on turning teachers into junior researchers. However we are fighting a more insidious culture that of the putting training entirely into schools where schools teachers have less exposure to the research and opportunities to do or be involved in research. Very few teachers have research degrees or experience of carrying out research and the Carter review said that the PGCE is, “not the relevant qualification” and we had a recent SoS who called the academic establishment the, “enemies of promise”. Whilst I am not claiming that all education faculties have the best practice (though some of this has been the pressure to deliver a curriculum designed and defined by the DfE and Ofsted and not build on academic research or principles) it is more likely that a student at university will come up against these new ideas then they will in a school where the teachers are under even more pressure to deliver the day-to-day stuff. At least at the university about 20% of my time is spend on reading and research. I do have a vision for teacher education which I have blogged about here (http://paulltnt2013.blogspot.co.uk/2014/04/the-future-of-teacher-supply.html?view=magazine) and here (http://paulltnt2013.blogspot.co.uk/2014/09/brick-walls-research-universities-and.html?view=magazine) I would love to see more teachers engaged and involved in research and in critically understanding the education theory (so for example I often see teachers talking about Paiget, Bloom, Vygostsky, Malsow etc.. without having read the authors so often ascribe things to them which are not true let alone the work of more recent cognitive neuroscientists and the challenges that their work provides), as you say there is much work to do on myth busting (the title of one of my sessions at the university). “We now know for example that left and right brain thinking is not supported by any evidence,” … if only it were true. “that if you are using Neuro linguistic programming in any form then you might as well be practising astrology”…… if only it were true. I used to work with a guy who would cure people of long held phobias in a about 20 mins. I witnessed this myself so although I was sceptical I know it is true. “the belief in learning styles is not just wrong but dangerous”… this is silly. I have never seen evidence that belief in learning styles is dangerous, in fact I have seen lots of evidence that belief in learning styles is useful. Dan Willingham asserts that there is little or no evidence that teaching to a specific learning style iss effective, but I have never seen anyone other than yourself and perhaps OldAndrew who might suggest that learning styles are dangerous. I think this blogpost indicates what I see as a key issue. People think their favourite research is the most important and that their interpretation / representation of their favourite research is the most incisive. “but I for one am excited by education incorporating these new findings around memory, retention and performance and incorporating them into their own professional practice and then making them applicable in the classroom” … but one could perhaps be forgiven for suggesting that in this respect you have a vested interest. I’d be interested in the evidence that belief in learning styles is useful, Brian. I also have to reply to the ill-informed nature of some of this blog. It seems, from over the ocean, that there are a team of you guys supporting each other. One guy says “hey, learning styles doesn’t exist” and the next one says “hey, you are right” and so on. Did Kolb (1984) not exist either? You have to be careful about being accurate about what you say about NLP. I have met Doctor Richard Bandler the founder of NLP. Yes, he is a doctor. NLP shows that we have three learning styles, It can even tell you which learning style you have from the way your eyes move. I do believe that is scientific and is known as “eye patterns”/ Therefore NLP is very valuable for teachers.Ive not seen people cured of phobias in 20 minutes but I have heard Richard Bandler tells stories about having done it himself in 5 minutes! Also, rapport techniques are helpful for teachers. NLP – what is there not to like? “NLP originated as a form of psychotherapy and (like CBT is doing now) invaded the classroom as a way of manipulating children’s personalities so that they ‘learn better’. As related above, NLP practitioners sometimes make extraordinary bold claims about the things it can treat. If it’s effective, then despite its flawed theoretical underpinning, there might be an argument in its favour. So, the serious question is, does it actually help people? Back in 1985, Krugman et al identified that some of the claims of NLP therapy were not standing up to scrutiny. Witkowski carried out a review of 35 years of NLP research, examining the research database in order to establish the strength of the evidence-base supporting this psychotherapy. He notes, despite the absence of NLP from any academic psychology textbook, that its tenets are informally applied within the UK education system. From the sample of articles, he found that a sizeable number merely contained polemics and discussion about the benefits of NLP rather than testing any empirical claims and that a similar number actually had nothing to do with NLP, but had somehow found themselves incorporated into the NLP research base. NICE do not recommend NLP as a psychotherapy and a number of reviews have found that it does not live up to its claims. Interestingly, this was in the news within the last year. The BBC reported that a Welsh charity was recently criticised for using NLP to treat war veterans suffering from post-traumatic stress. Dr Neil Kitchiner, head of the NHS All Wales Veterans Health and Wellbeing service, said he has not seen evidence of the treatment working. Reblogged this on Education Web Gems. Because schools are run by people. In my experience, they’re run by people who have moved from teaching to leadership and this qualification process does not require a thorough knowledge of the evidence, nor an understanding of how to think critically. Sometimes all it requires is a kind of selfish ambition (with apologies to all senior leaders reading this who are indeed dedicated to education!). People are naturally very skilled at filtering and so the theories that they like the sound of are the ones that stick. Schools have cultures created by the pet theories of their leaders and it’s very difficult to break away, or work against these, even with the evidence staring us in the face. Are you talking about the celebrity hypnotist Paul McKenna? Is it possible, rather, that the research informed his views? Paul’s comment (and a couple of others above, e.g. Brian) seem to perfectly illustrate the Semmelweis Effect, and to highlight the difficulty that Carl describes in challenging people’s preciously held beliefs with evidence. I’ve seen Paul Daniels do stuff that you wouldn’t believe. I can guarantee that if you saw it, you’d like it. Not a lot, but you’d like it. The reality is that most teachers used their nous and common sense and took the message from learning styles that they need to use a variety of tasks, approaches and styles in their lessons and that when under stress they would defer to one tried and tested way of organising learning – one they felt comfortable with. It merely reminded teachers that they have 30 different individuals in the lesson so try and find a way to engage as many as you can. In my experience, very few took/ take it literally. I think the flourishing of pseudo-science in education stems from the myriad accountability systems that teachers, departments and schools find themselves in. The methodology that purports to make outcomes just 1% better will be picked up and run with by anyone under pressure to ‘raise standards’. Combine this with spurious evidence claims, an easily sold public and some savvy marketing and it’s a multi-million pound industry leeching off a financially starved public service. Thank god this is the only case of that happening, eh? technological world all iis existing on web? The other thing I’d just like to mention is that sometimes research/science is later proven to be incorrect. Medicine offers us several examples of a ‘wonder drug’ which later turned out to be harmful. The danger of going wholesale down any route is the ever present danger of being wrong. Moderation in all things would seem, in that case, to be a good idea. wished to say that I’ve really enjoyed browsing your weblog posts. I didn’t know much about NLP so recently got chatting, socially, to a lady who is building up a business as a coach for women feeling a particular way about their lives, who mentioned being an NLP Practitioner. In the conversation I shared comments from here around doubts about NLP, perceived dangers of it, science vs myth etc and we talked these through. What she expressed was simply what NLP means to her and what practices she finds useful for helping her specific client niche with their blocks. Nothing she said raised alarm bells for me. Here’s the thing: the difference between her and any school teacher in our current system is that her audience (clients) are attracted to her promises and her business i.e, her ability to sustainably live and help more people in her own way depends on her clarity about what she does, who it’s for, time-scales and the hows/whys of her methods so that those who commit to her are delighted and share her work… teachers have a captive audience which means the outside world naturally feels a need to cap non-standard teacher practices, leading to a mass of safe, conservative teaching practice in schools. Does anyone else think we’re loosing out in a system that’s confusing the right to learn with the right to teach? Hi, I commented above – but it says my comment is awaiting moderation – did I get lost in the aether? I haven’t re-blogged before but this was worthy of the exception (perhaps a new trend!) Thoroughly enjoyed this read. Education has mostly abandoned the once popular, heavily promoted ‘scientific’ behaviorism paradigm. Education has mostly abandoned the once popular, heavily promoted ‘scientific’ cognitivist expert-novice paradigm. Education has mostly abandoned the once popular, heavily promoted ‘scientific’ constructivism paradigm. Education has mostly abandoned the once popular, heavily promoted ‘scientific’ competency-based paradigm. Education has mostly abandoned the once popular, heavily promoted ‘scientific’ self-regulation paradigm. Education has mostly abandoned the once popular, heavily promoted ‘scientific’ learning-styles paradigm. My not too naive guess is that in time, education will abandon the now popular, heavily promoted ‘neuroscientific’ paradigm. A symptom of its weakness is that up until now, this paradigm not resulted in clearly better education anywhere. I am not surprised that fashionists defend their kind of fashion. But I keep being surprised that even scientists cannot distinguish their favourite fashion from real science. Moreover, I am not sure whether teachers who have set their sails to every ‘scientific’ wind during their career, are better off than their colleagues who chose sailed to their own compass.